If you’re still playing with the idea of coming out to PrimalCon next year this is the time to register. In the four weeks since I opened registration more than half of the available slots have been filled and I expect more sign-ups to come in before the special pricing expires on July 31. 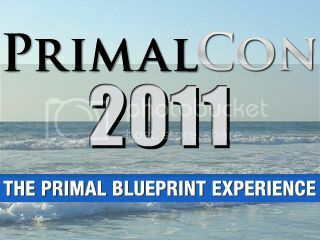 Also in the last four weeks my team and I have begun to further solidify the PrimalCon 2011 agenda. Needless to say we’re going bigger and better this time around. I’ll be leaking updates between now and April 2011, but think Survivor-style team challenges, after-dinner dance parties, personal massages, group ocean plunges, lavish Primal feasts, educational seminars, and a good dose of rest and relaxation all at a beautiful beachside resort in sunny Southern California. There will be plenty for beginners, Primal veterans and all skill levels alike. Come to kick start or re-energize your Primal lifestyle, learn a ton of valuable information you can apply in your life immediately, and connect with some of the friendliest, like-minded people you’ll ever meet. Learn more about PrimalCon 2011 here. There are only 3 days remaining to save $100 off the total registration price and space is going quickly so reserve your spot today. P.S. If you’re interested in payment plans or have any questions contact my office at 310-317-4414. PrimalCon Oxnard 2015 – The One and Only! Happy Holidays from Lil’ Grok and the Korgs! Unfortunately I live on the other side of the country and have a lot of other obligations (work, family, etc.) so I will not be able to attend this. However, from time to time I stumble across announcments about your attendance at various shorter events. If I recall correctly, I saw on some webpage that you were speaking for 2 hours at a Crossfit affilite somewhere. I wish you would have a listing of places where you speak other than thsi conference. OP on this comment. I realize at the top of this page there is a link “Announcment: Free Events” but still I know there are other paid events. For example, I came across a link to this on the CrossFit webpage. I wish there was something like this in my area. I’d come. But I’m a vegan. Everybody’s welcome! Food options might be slightly more limited for a vegan menu but we could make it work if you’re interested in coming. Any chance of single day pricing this year? Sorry, no single day pricing. Oh how I wish I was not a student. As soon as I hit it as a big shot lawyer the first thing im doin in going to PrimalCon!! We’ll see you then, Athena! I can not wait for this Mark!! You make it sound like too much fun so I am expecting one hell of time! I was thinking, maybe make a Primal Con Facebook page/event so people that want to go or have added themselves can. Hi Mike, actually there is! That would be pretty sweet. Having a dedicated area to people who are already signed up for Primal Con. I would be in this area, say a facebook page or group constantly. People who want to sign up but aren’t sure of it can ask questions about the event, etc. I was going to make plans to be there, however, this is the same time as the Baker to Vegas Challenge Cup Relay – which I plan not to miss. PrimalCon 2012 here I come. I have not checked your web site for a few days. i’m glad i did today (last day for the discount) cause we were unavailable for 2010 April. my understanding is we have to book the hotel room. the registration is 7:30AM! so we’d better arrive the night b4. Would love to go, but it’s the weekend right before the Boston Marathon! I realize you can’t accommodate all race (or individual) schedules, but would love to see this scheduled for a different weekend at some point in the future.